↑ "Bolshoy Ice Dome – Venues – Sochi 2014 Olympics". Sochi2014.com. 21 December 2013. मूल से 19 February 2014 को पुरालेखित. अभिगमन तिथि 8 February 2014. ↑ "Shayba Arena – Venues – Sochi 2014 Olympics". Sochi2014.com. अभिगमन तिथि 8 February 2014. ↑ अ आ इ "Big ice in Sochi 2014". Iihf.com. अभिगमन तिथि 8 February 2014. ↑ Kevin Oklobzija (2014-02-22). "Teemu Selanne ends Olympic career a medalist". Usatoday.com. अभिगमन तिथि 2016-09-27. ↑ Dave Lozo (22 February 2014). "Olympic Hockey 2014: Finnish Flash Teemu Selanne Cements His Legacy". Bleacher Report. अभिगमन तिथि 2016-09-27. ↑ "Olympics". Iihf.com. मूल से 7 February 2014 को पुरालेखित. अभिगमन तिथि 8 February 2014. 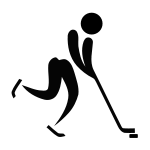 ↑ "27 events in IIHF program". Iihf.com. अभिगमन तिथि 8 February 2014.